traditional, Southern-style pit BBQ to your location! I really cannot express enough how thankful we are to have been able to experience the professionalism and service of your team. Thank you for standing firm and resolute as we all withstood mother nature and persevered to enjoy some really incredible food. I believe most everyone I spoke with had nothing but the ultimate of compliments for what their taste buds experienced. Thank you. Will hope to cross paths again soon. Enjoy the remainder of your summer and be safe. My husband Nick and I can't recommend Smoking J's BBQ in Hudson Valley highly enough. Work with these guys; share their food with your guests; no one will regret it! We're so glad we did. We found Smoking J's online, after confirming our wedding venue, an outdoor space on a horse farm near Hudson for summer 2017. 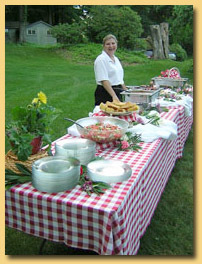 We were preparing for a big wedding of 250 guests, outdoors, who we wanted to feed well without completely breaking the bank. We also knew we were looking for someone who we'd enjoy hanging out with. ...We knew we were looking for just the right caterer; we just weren't quite sure how to identify them. Jerome from Smoking J's met us for a coffee one winter weekend near Pawling, where he's based. It was a match from the start. We said that day-- and we've said ever since-- that Jerome feels like-- and now IS-- a friend. The food was simply perfect. Jerome and his team cook onsite, so we avoided having a lot of prepared food being trucked to a venue on warming plates, getting limp or stale in the process. I'm writing this review 8 months post-wedding, and people still talk to us about how great that food was. It was the perfect combo of delicious, well-prepared, well-presented-- but unpretentious and down to earth for our outdoor day-time setting. Finally, Jerome and his team proved to be champs at improvising with us and the rest of our wedding team on that big day. We ordered a series of passed appetizers for our cocktail hour. When the afternoon arrived, a huge but short thunderstorm caused us to decide on the spot to switch the timing of our open-air ceremony and our (under cover of tent) cocktail hour-- which meant that Jerome suddenly had 1 hour less time to prep the food. He didn't bat an eye. The guests were happy, and so were we. After the rain, his waitstaff went to the ceremony area and wiped down all 250 chairs for our guests. The sun broke through, the ceremony was great, and then, best of all: we got to eat. We can't thank Jerome and his crew enough. You and joe are rock stars. I can't thank you enough seriously. The food was the talk of the party and truly made it so so special! I had another question. I know 18% gratuity was included but I'm not sure whether or not that included the servers - please let me know bc if it didn't, I want to make sure to send them a tip. They were both so so helpful and couldn't have appreciated their help more!!! Thank you so so so so so so much!! Can't wait to use you again!!!! " Contact us today, and let's get your party smoking!